With Christmas 2016 upon us here are two books which any motorcycle racing enthusiast would like to find under the Christmas tree. They say a picture paints a thousand words and these two photo-autobiographies “GIACOMO AGOSTINI A LIFE IN PICTURES” and “JOHN SURTEES MY INCREDIBLE LIFE ON TWO WHEELS AND FOUR” certainly do that. Both are primarily photographic accounts of the lives of these two motor racing giants, beautifully presented on high-quality glossy paper as hardback coffee table size publications. 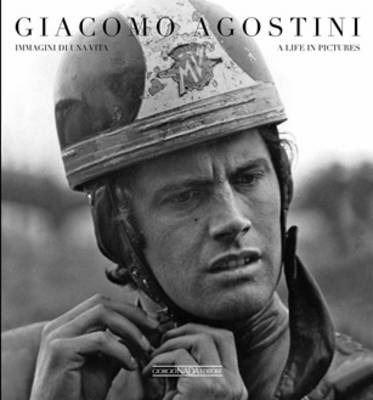 Agostini’s book is co-authored by Italian Mario Donnino, a long-serving reporter for well-known motorsport magazine Autosprint, Donino’s almost poetic narrative is combined with quotes provided by Agostini that reveal his highly competitive nature and a search for perfection in his racing. This is hardly surprising for a man who has won eight 500cc (MotoGP) and seven 350cc World Championships accumulating along the way 122 Grand Prix victories. It is the photographs, however, most of which are from Agostini’s own collection, that enrich this book so much,. It allows the reader to look back in time, from the late 1950’s to the mid 1970”s, to an era considered to be “Golden” in the sport of Grand Prix motorcycle racing, and sometimes also deadly to its participants. The photographs, such as the MV Agusta mechanics working in the factory workshop, and those of Giacomo socialising with his racing rivals are priceless. 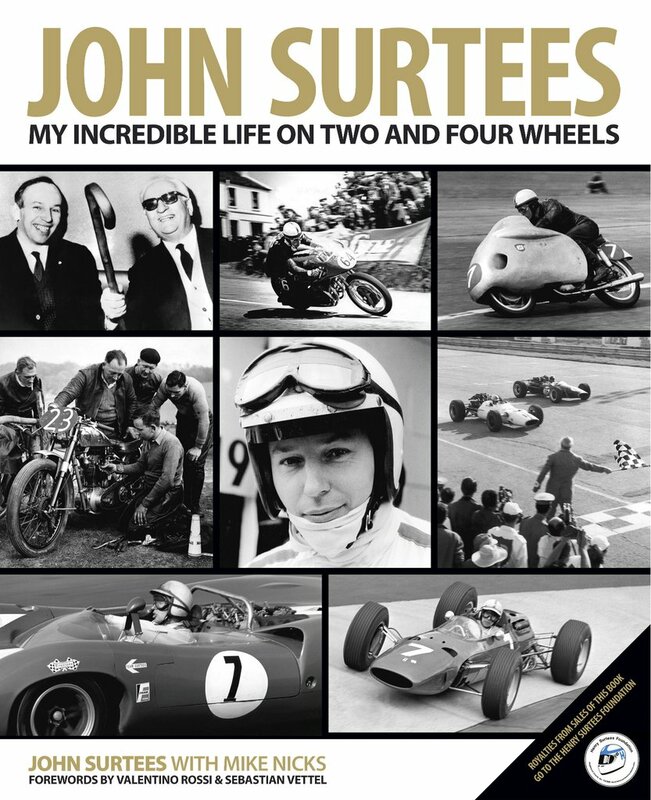 John Surtees’ book is co-authored by well-known journalist Mike Nicks who has contributed to specialist magazines such as MCN, Classic Bike among many others. The format is very similar to Agostini’s tome with the photographs accompanied by Surtee’s own description that gives an intimate voice to the book. Surtees, of course, is the only man to ever win both the 500cc (MotoGP) World Championship (four times) and the F1 World Championship with Ferrari in 1964. Surtees also won the inaugural CAN-AM series in 1966 and later became an F1 car constructor in 1970 with his cars winning the European Formula 2 title with Mike Hailwood in 1972. But these are just headlines of a long and enduring career, and this book reveals so much more. Royalties from “JOHN SURTEES MY INCREDIBLE LIFE ON TWO WHEELS AND FOUR” go to the Henry Surtees Foundation which was set up to honour the memory of John’s son Henry, who was killed in a freak accident at Brands Hatch in 2009. The above books are available from the Book Depository. This entry was posted in Books, Motoracing, Motorcycle Racing and tagged 500cc World Champion, Book Depository, F1 World Champion, Ferrari, Giacomo Agostini, John Surtees, MV Agusta on 29/11/2016 by Geoff Dawes.